The .config/monitors.xml file is shown below. Notice that the HDMI display (green in the photo) is set as <primary>yes</primary>. Nevertheless, this seems to be ignored - the behaviour is the one mentioned above (desktop icons on the left and writer opening on the left) . It's unbelievable that this bug hasn't been fixed in more than a year and a half. How difficult is it to add a "Primary monitor" setting? I can confirm the same problem exists with Xubuntu x64 16.04 as well. However I can also confirm that this has been a problem with all Ubuntu flavors for many years. The difference now is that nothing can be done on the user side to fix it. After all these years I'd become quite adept at editing display.xml and monitor.xml files, xorg.conf files, etc. but now none of that works. The only thing I haven't tried is changing Compiz settings, but that's because Xubuntu doesn't run Compiz by default, and people running Compiz have already reported that it can't be fixed their anyway. I know the developers work hard and always have their plates full, but if they could at least fix it enough that we could edit conf files again it would be great. xubuntu and unity use different components so the issue is not the same, could you open another bug about the xubuntu issue? I can also confirm that I'm experiencing this problem on Ubuntu x64 16.04. If there is any information I can provide to solve this bug, then please let me know! Not definitely a bug. But I consider this feature is good and very important to have. When can we expect fix for this? Any timeline? It definitely still is a bug, since changing the setting (albeit in a hidden away config file) has no effect. That said, this bug still very much exists and annoys me. Confirm this in Ubuntu 16.04.1 LTS. I've an external monitor attached via HDMI. It sit on THE LEFT of my main monitor (laptop). I need to set my laptop monitor as primary monitor and I want the system to know the external one is on the left. If I use the Display application and drag my monitor on the left it become the primary monitor. Can confirm this bug is still present in Ubuntu 16.10. This bug is also present in Mint x64 18.1. Eagerly awaiting a solution or workaround! This bug is also present in ubuntu x86_64 14.04.5. It would be nice to have an option in GUI to set primary monitor to yes in monitor.xml. This bug still happens in Ubuntu x86_64 17.10 development branch with Gnome 3.26. Still the same on Xubuntu / Ubuntu 17.04. There are a few places to set which is the primary display, but they are useseless. I have the option in nVidia Settings and Display in Settings. None help. It's very anoyting, since my big monitor is on the right, and as I open new things, or even Save File popup slections keep going to the small left monitor on my laptop! Sorry, to complement my comment. I'm running xfwm4 and xrandr says my big monitor IS the primary. Just a quick update on Ubuntu 17.10. Yes, you can change your primary monitor on Gnome 3.26. You'll just have to go to "Settings > Display" and click on "Primary Screen" (i'm translating that to enlgish, so it might not be exactly this name) and select the monitor that you'll have as your primary one. Primary screen just didn't look like a button, so I didn't think of it until i tried it :P Editing the the bug to "this bug does not affect me". Unbelievable. It's 2018 and the bug is still unresolved. Having this bug not fixed is one of the main reason why people like other operating system than Linux. This is a basic feature and option that should not takes hours and command line to use. By the way "Settings > Device > Display, just show Could not get screen information" on my side. However, when opening "Screen Display", I have several options but not the one to identify my main screen. Please fix this it was open for years, it is unbelievable!!!!!!!!!!!!!!!!!!!!!! Have you even tried 18.04? It's using GNOME by default, and you can select the primary screen from the monitor capplet.. is that not enough? >Have you even tried 18.04? It's using GNOME by default, and you can select the primary screen from the monitor capplet.. is that not enough? It's still the same. 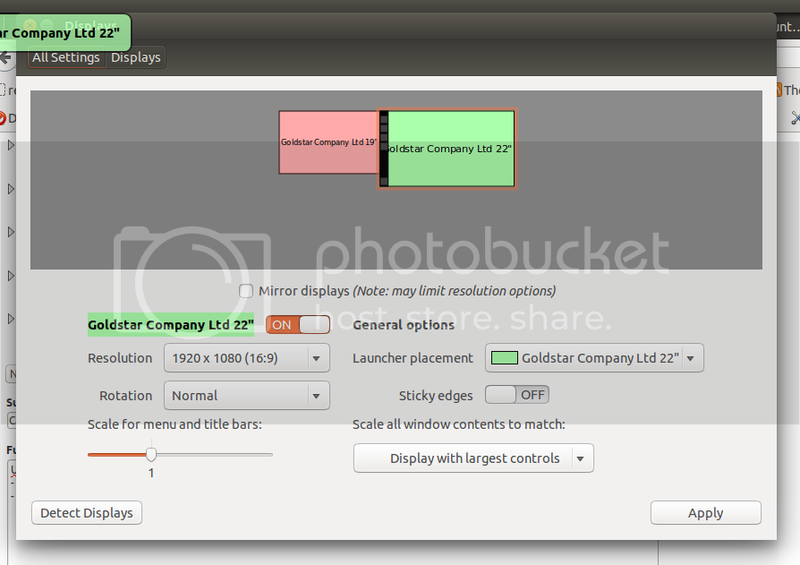 You can select primary monitor, but most applications will not respect it and will run only on the left monitor. If your primary monitor is on the right, everything works perfectly though. Does this bug still affect Xfce? If yes, please open a separate bug report.